Jamaica is a hugely popular tourist destination, and is seeking to redefine itself as a global logistical hub. Combined with a large bauxite-alumina industry there are a lot of reasons to visit Jamaica for business or for pleasure. In either case, to make the most of your trip you’ll need to buy Jamaican dollars. Jamaica has a long currency history. The first money used in the country was Spanish coins called maravedis. For many years, Spanish dollars dominated trade in the Americas and much of the world. Even under British rule Spanish dollars (known as pieces of eight) continued to be the de facto currency. Spain relied on silver mined in her South American colonies to mint Spanish dollars, but a series of revolutionary wars led by Simon Bolivar resulted in the loss of these mines, and the end of the Spanish dollar’s dominance. The last Spanish dollar was minted in 1825 and Britain soon introduced British sterling to its colonies. Sterling was introduced at a rate of 1 Spanish dollar to 4 shillings and 4 pence. This rate actually overvalued the Spanish pieces of eight by 2 pence relative to the value of gold in the British sterling. In British Caribbean colonies, the rate was adjusted so that one shilling was worth ¼ of a Spanish dollar. By 1840 the British Parliament declared that only British currency would be legal in Jamaica. Jamaica minted its first unique coinage in 1869. In 1904 the country’s first government authorized notes were printed. In 1960 the Bank of Jamaica took over all printing and minting responsibilities in Jamaica. Eight years later the Jamaican government replaced the Jamaican pound with the Jamaican dollar. Jamaican coins currently in circulation are the 1c, 10c, 25c, $1, $5, $10 and $20. On the obverse of all coins is the Jamaican coat of arms. 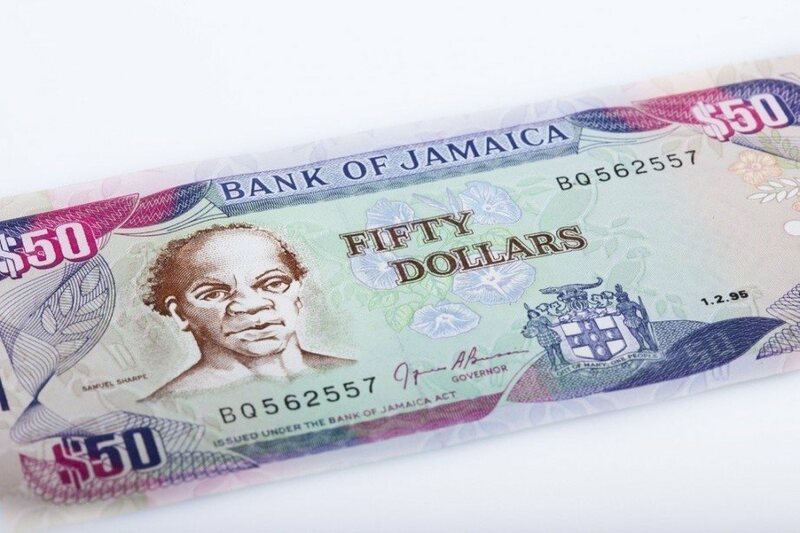 Jamaican notes currently in circulation are $50, $100, $500, $1000. 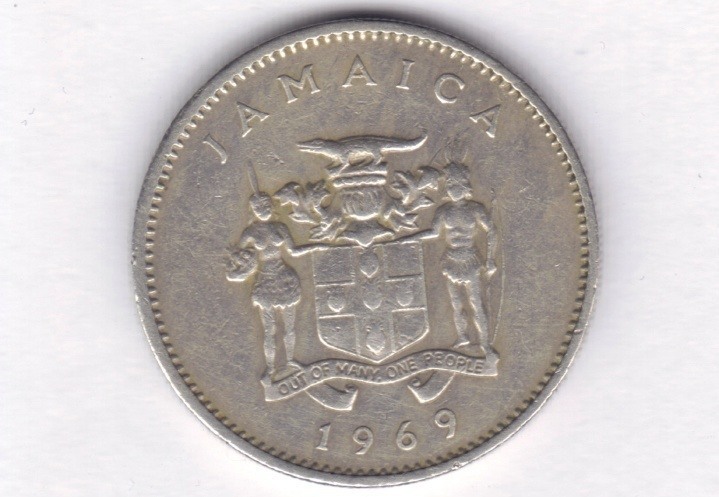 In 1968, when it was first introduced, the Jamaican dollar was worth 10 shillings. It peaked at a value of J$0.77 to US$1 but continually devalued since this high to below J$115 to US$1 in 2015. Jamaica has a mixed economy with an ideal climate for agriculture and tourism. Bauxite – and aluminum ore – is the country’s largest natural resource and the bauxite-alumina industry is one of the country’s most important. Agriculture, particularly sugar cane, coffee and cocoa, remains an important industry. Tourism is responsible for about ¼ of the country’s jobs and 50% of foreign exchange earnings. Jamaica has recently embarked on a project to emulate Singapore and Rotterdam to become a major international logistical hub between the Americas and Europe and Africa. Inflation has been a persistent problem in Jamaica and has devalued the Jamaican dollar against the US dollar. The world’s hunger for aluminum shows no sign of abating, nor does the tourism industry, and if Jamaica can strengthen its financial sector and succeed in its plan to be a logistical hub then the country will make good on its high potential. 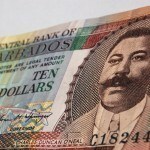 Order Jamaican dollars with FXtoGO! Whether you need to buy Jamaican dollars or one of many other currencies, we’ve got you covered with FXtoGO! 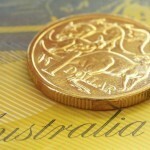 You can also track the exchange rate of your favourite currency with Rate Watch. For a broader understanding of Jamaican history and culture check out our Country of the Week profile. For information about traveling to Jamaica then be sure to follow our Travel Guide.